Following the iterative design process, the designer can jump between cycles or utilise any of the ‘design tools’, in almost any order, any number of times, until a final product is manufactured and evaluated. 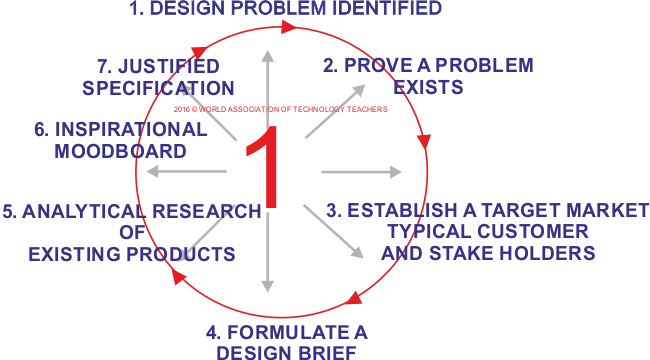 This iterative design process is for guidance only. A genuine problem is identified. Explained in detail, with written photographic / video evidence. An Alternative layout - Working from a Contextual Challenge. How to Identify an Everyday Design Problem. You must find evidence that a genuine problem exists, one that merits spending time researching, developing ideas and manufacturing a product and all the extensive costs involved. Initial research is carried out, to proved that the problem is one that should be solved, to improve the lives of others in some way. Initial questionnaire / survey of potential customers, to ensure that other interested people view the problem as one worth solving. 3. ESTABLISH A TARGET MARKET, TYPICAL CUSTOMER AND STAKE HOLDERS. What / who is the potential target market? Who is the typical individual customer? Written outline possibly with a photograph of a potential customer, called a customer profile. Use the findings of a questionnaire and the views of potential clients, to formulate a design brief. A moodboard that has been composed with the help of a potential client. This helps to determine their likes and dislikes, in terms of style, aesthetics and function. A justified specification is a summary of the key points / issues, identified by your research and analysis.